Accurate prediction of the magnetic control torques requires that the coils be supplied with a constant current. Control of the coil current is necessary for two reasons: the supply voltage may fluctuate considerably (±30% from nominal for some missions), and the resistance of the current-carrying element changes with temperature. All jets or tkrusters produce thrust by expelling propellant in the opposite direction. The resultant torques and forces are used for five principal spacecraft functions: (1) to control attitude, (2) to control spin rate, (3) to control nutation, (4) to control the speed of momentum wheels, and (5) to adjust orbits. Gas jets produce thrust by a collective acceleration of propellant molecules, with the energy coming from either a chemical reaction or thermodynamic expansion, whereas ion jets accelerate individual ionized molecules electrodynamically, with the energy ultimately coming from solar cells or self-contained electric generators. Gas jets are widely used, whereas ion jets are not yet developed enough for spacecraft use. Schmidtbauer, et al.,  provide a survey of all types; Junge and Sprengel , Pye , LeGrives and Labbe  and Vondra and Thomassen  describe work on ion thrusters which may lead to flight-qualified units. A hybrid flight-qualified unit in which solid Teflon® is vaporized by a high-voltage electric discharge is described by Au and Baumgarth . Gas jet hardware and applications to attitude control are discussed here, mathematical models in Sections 7.10 and 17.4, and control laws in Section 19.3. Gas jets are classified as hot gas when the energy is derived from a chemical reaction or cold gas when it is derived from the latent heat "of a phase change, or from the work of compression if no phase change is involved. Hot-gas jets generally produce a higher thrust level ( > 5 N) and a greater total impulse or time integral of the force. Cold-gas systems operate more consistently, particularly when the system is operated in a pulsed mode, because there is no chemical reaction which must reach steady state. The lower thrust levels (< 1 N) of cold-gas systems may facilitate more precise control than would be available with a high-thrust system. Hot-gas systems may be either bipropellant or monopropellant. Fuel and oxidizer aré stored separately in a bipropellant system; very high thrust levels (>500 N) can be obtained, but the complexity of a two-component system is justified only when these thrust levels are required. Monopropellant systems use a catalyst or, less frequently, high temperature to promote decomposition of a single component, which is commonly hydrazine (NjH^) or hydrogen peroxide (HjOJ. Hydrazine with catalytic decomposition is the most frequently used hot-gas monopropellant system on spacecraft supported by Goddard Space Flight Center. The problem of consistency, mentioned above, manifests itself in two ways. First, the thrust is below nominal for the initial few seconds of firing because the reaction rate is below the steady-state value until the catalyst bed reaches operating temperature. Second, the thrust profile, or time dependence of thrust, changes as a function of total thruster firing time; this is significant when a long series of short pulses is executed, because the thrust profile for the later pulses will differ from that for the earlier pulses. The latter problem has been ascribed by Holcomb, et al.,  to aniline impurities in the grade of hydrazine usually used as fuel. Murch, et al., , Pugmire and O'Connor , and Grabbi and Murch  describe the development of electrothermal thrusters in which decomposition of the hydrazine is initiated at a heated surface within the thruster; these thrusters reportedly function consistently, with a well-defined thrust profile, over a wide range of pulsewidths and total burn times. Variable thrust profiles can be modeled as described in Section 19.3, but the models are more complicated and are probably less accurate than those for consistently reproducible thrust profiles. In near-Earth orbits, either jets or magnetic coils (Section 6.7) can be used for many of the same purposes. The control laws for jets (Section 19.3) are simpler than those for coils (Sections 19.1 and 19.2), primarily because jets produce larger torques. The magnetic torque produced by a coil depends on the local magnetic field, which varies as the spacecraft moves in its orbit; a coil command frequently must extend over a large fraction of an orbit or over several orbits to achieve the desired results. The propellant supply required for jets is the major limitation on their use; a fuel budget is an important part of mission planning for any system using jets. Other considerations are the overall weight of the system and the need to position thrusters where the exhaust will not impinge on the spacecraft The latter consideration is especially important when hydrazine is used, because the exhaust contains ammonia, which is corrosive. The only magnetic fields associated with gas-jet systems are those generated by the solenoid valves; these will generally be smaller than those associated with magnetic control coils, but may be significant in some cases if experiments on the spacecraft are adversely affected by stray fields. In more distant orbits (certainly beyond geosynchronous altitude), jets are the only practical means of interchanging momentum with the environment High-thrust or total impulse requirements may indicate a hot-gas system. Otherwise, the cold-gas system may be favored because hydrazine freezes at about 0° C and may require heaters if lower temperatures will be encountered during the mission. Specific components may affect the relative system reliability; for example, hydrazine systems use tank diaphragms to separate the propellant from the pressurizing agent and also require a catalyst or heater to initiate decomposition; cold-gas systems may have a pressure regulator between the tank and the thruster. spacecraft will perform measurements of ultraviolet spectra of stars from a geosynchronous orbit. The hydrazine system will be used for attitude, spin rate, and nutation control in the transfer orbit and for orbit adjustments and momentum-wheel speed control thereafter. A hydrazine system is needed to meet total impulse requirements over the 3- to 5- year mission lifetime. The plume, or envelope of the thruster exhaust, has been analyzed to determine whether ammonia is likely to condense on the telescope optics; this was found not to be a problem. 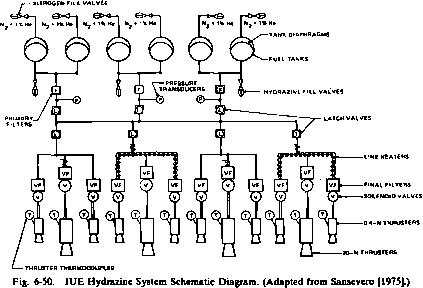 Figure 6-49 shows the 1UE hydrazine system, which was designed for assembly as a complete unit to be attached subsequently to the spacecraft. The octagonal framework is approximately 137 cm between opposite faces. Four thrusters are mounted on the octagonal faces; two of these can be seen on the leftmost face in Fig. 6-49. Eight additional thrusters are mounted in two clusters of four thrusters each; one cluster is suspended from the octagonal face closest to the camera, the other from the opposite face. Each cluster contains two large thrusters, each generating about 20 N, which are used for attitude and nutation control and orbit adjustments. The two small thrusters in each cluster and the four body-mounted thrusters each generate about 0.4 N for spin rate control and momentum unloading. Spherical fuel tanks are mounted in six of the eight bays. A diaphragm in each tank separates the nitrogen pressurizing gas from the hydrazine fuel. Opposite tanks are connected in pairs to minimize imbalance as fuel is consumed. Fuel flows through one filter and two latch valves between the tanks and thruster assemblies. Pressure transducers located between the filters and latch valves allow the amount of fuel remaining in each pair of tanks to be estimated. As shown in Fig. 6-50, all lines are interconnected between latch valves to minimize the effect of a valve failure. Fuel lines from the spacecraft body to the suspended clusters are heated to prevent freezing. The thrusters are also provided with heaters to maintain the proper operating temperature, which is measured by thermocouples on each thruster. An additional filter and solenoid valve is associated with each thruster. In operation, latch valves are open and the system is controlled with the solenoid valves on selected thrusters. The system as built weighs almost 25 kg without fuel. The fuel budget for the mission is about 12 kg. During the mission, thrusters will be operated with firing times as short as 0.1 sec during attitude maneuvers and as long as several minutes during spin rate changes or orbit maneuvers. Other Representative Systems. Most cold-gas systems are functionally similar to the IUE system. The major differences are that the propellant is stored as a liquid above the critical pressure and is self-pressurizing. Heaters are not required because the propellant is a gas at low pressure at any temperature likely to be encountered in operation. Pressure regulators are usually used to control propellant flow rate. The OSO series of Earth-orbiting spacecraft combines a cold-gas system with magnetic coils. The coils are usually used for attitude control. The gas jets are used for occasional rapid maneuvers which cannot be performed with the coils and for correcting secular angular momentum changes caused by gravity-gradient and residual magnetic torques. 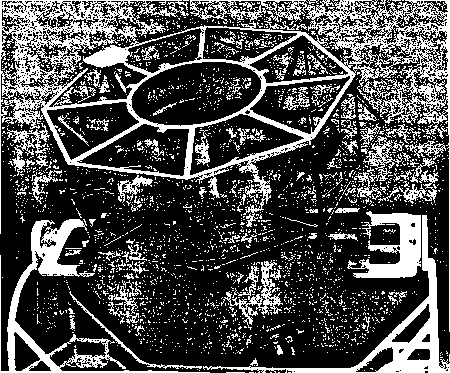 The RAE-2 spacecraft, placed in lunar orbit in 1973, carried both a hydrazine hot-gas system for orbit corrections and a Freoni®cold-gas system for attitude and spin rate control. Although single systems can be designed to perform all three functions, the RAE-2 mission required the ejection of the orbit-correction system before all attitude and spin rate control functions were completed. 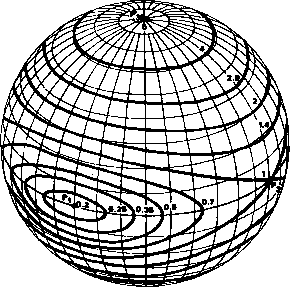 The impulse potential of a hot-gas system was required for the orbit changes, but a simpler cold-gas system sufficed for the other requirements. The ISEE-1 and -2 spacecraft were placed simultaneously in an orbit with an apogee of about 22 Earth radii on October 22, 1977, to study the interaction of the solar wind with the magnetosphere. Attitude control is used to maintain the spin axes at the North Ecliptic Pole; spin rate control is needed to maintain a constant spin rate; and orbit maneuvers are performed to maintain the desired distance between the two spacecraft. The estimated total impulse requirements for all three functions over the 3-year mission lifetime can be met with a Freori® cold-gas system. In general, onboard attitude control is obtained by combining onboard sensors and torquers through a control law (Chapter 18), or control strategy, which is implemented via analog logic or a digital computer. Because attitude control systems are normally chosen for reliability and cost, control laws which are easily implemented through analog logic have been widely used. Sensors such as analog Sun sensors (Section 6.1), and wheel-mounted horizon sensors (Section 6.2), are well suited for such applications because the sensor output is simply related to an angle which is to be "controlled. Reaction wheels, momentum wheels (Section 6.6), or jets (Section 6.8) are preferred torquing devices because in many applications there is a simple relationship between attitude errors and the appropriate torque commands. In addition, magnetic torquers (Section 6.7) are often used in conjunction with a magnetometer. Increasingly stringent spacecraft attitude conirol and autonomy requirements (Chapter 22) have resulted in the need for onboard computers (OBCs) or digital processors. Digital processors afford several advantages over analog systems [Schmidtbauer et al., 1973], including the capability of processing complex types of data—such as star tracker, gyroscope, or digital Sun sensor data—and of modifying programmed control laws via ground command. In an attempt to standardize flight hardware, NASA's Goddard Space Flight Center is developing the NASA Standard Spacecraft Computer NSSC, which was derived from the OAO-3 onboard computer and is similar to that of IUE. The NSSC-I will be flown on the Solar Maximum Mission (SMM) and on subsequent flights in the Multi-mission Modular Spacecraft series. A second, larger version, the NSSC-II, will be used for Spacelab payloads and the Space Telescope. The specifications for the NSSC-I, NSSC-II, and HEAO digital processor are shown in Table 6-13. Timing estimates for the NSSC-1 and NSSC-11 are given in Table 6-14.